Tory infighting has escalated this week with increasingly bitter ‘blue on blue’ attacks in the debate on whether Britain should vote to leave the EU in just six weeks’ time. 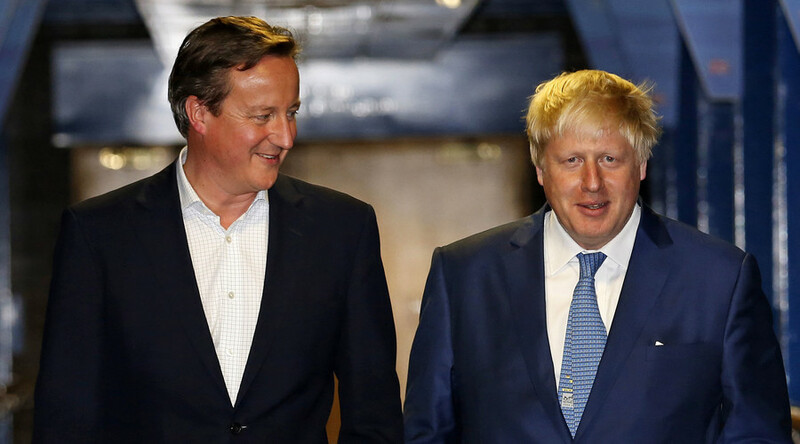 Despite Prime Minister David Cameron urging his party not to tear itself apart, recent exchanges show the referendum campaign is causing a split among senior members of the Conservative Party. Whatever the outcome of the referendum on June 23, it seems Cameron will have to consider some delicate party reshuffling to keep a grip on power. RT delves into the divisions bubbling among the Conservatives. Iain Duncan Smith, a former Conservative leader and long-time Euroskeptic, has fueled his long-standing feud with Chancellor George Osborne this week by saying the Treasury should be broken up. Duncan Smith called the department “the worst thing in Britain,” claiming it is characterized by a “lack of vision” and a “short-term” obsession with cuts, Politico reports. The Brexit campaigner resigned as work and pensions secretary in March over proposed disability cuts by Osborne. “One of the things when I left government was the sigh of relief that I never have to deal with those people again,” Duncan Smith says. Gove told the House magazine there are “fundamental problems” with Cameron’s deal. “Even though the Prime Minister tried incredibly hard, the deal itself is disappointing. It doesn’t take any powers back, it doesn’t fundamentally alter the shape or direction of the EU. It doesn’t end the perverse movement of the European Parliament between Brussels and Strasbourg, which we said we were going to alter. It doesn’t change the common agricultural policy, it doesn’t change EU structural funds, it doesn’t have a particularly powerful break on migration. Former Tory Prime Minister Sir John Major is accusing Brexiteers of “morphing into UKIP” with their emphasis on immigration, claiming they are stoking fears and prejudices. “This is their trump card. I urge them to take care. This is dangerous territory that, if handled carelessly, can open up long-term divisions in our society,” IBT reports. “We must not let emotions be stirred by false fear, nor allow that false fear impair our judgment on the future of the country,” Major, who is vehemently pro-EU, says. His comments are believed to be thinly-veiled criticisms of ‘leave’ campaigners Boris Johnson and Michael Gove. Major’s first intervention on the debate comes after claims from the Office for National Statistics that there are a million more long-term immigrants from the EU than recorded in official statistics, which did not take into account short-term migration. Charles Lewington, Major’s former press secretary, told the Times the divide reminded him of the ill-feeling in the party in the 1990s following the rebellions over EU’s Maastricht treaty. He says even if Cameron wins the referendum and conducts a unifying ministerial reshuffle, “there will still be a lot of bad blood” running through the party. The Tory civil war escalated earlier in the week when opposing camps clashed over Cameron’s claim a Brexit could make conflict in Europe more likely. Johnson responded, suggesting the claim was “wholly bogus” and argued that far from keeping the peace, the EU had stoked tensions in Ukraine. Cameron has this week refused to take part in a TV debate with pro-Brexit Conservatives Boris Johnson or Michael Gove, saying he doesn’t want a ‘blue on blue’ attack. He has agreed instead to appear on an EU debate program with United Kingdom Independence Party (UKIP) leader Nigel Farage, a move which has drawn the ire of Vote Leave campaigners. Johnson has however vowed to debate with “anybody,” as he continued his tour of the country to promote a Brexit.